Google knows a thing or two about streaming. You only have to look at the success of the Chromecast, which is now in its second generation. The Google Chromecast Audio saw the company turning its expertise to music streaming. This little device was designed to bring wireless streaming to your offline speakers and amplifiers. And we thought it was a huge success, which only makes the fact it was discontinued by Google in early 2019 all the more disappointing. Presumably the increasing ubiquity of products with Chromecast built-in makes it somewhat redundant in Google's mind. Read on for our original review, and for a lot of reasons why you should buy one - if you can find one on sale. The Chromecast Audio is a small disc the size of a Jaffa Cake. 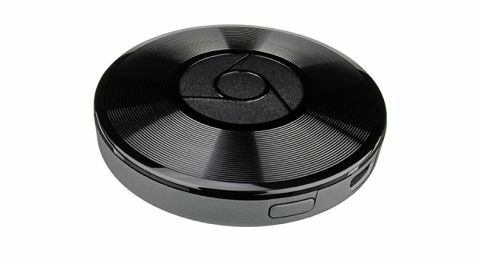 At first glance it is almost identical to the ‘regular’ Chromecast, but the Chromecast Audio has tiny circular grooves to evoke the image of vinyl records - a bold statement of intent to supplant the black stuff, maybe? So where does the music come from? You’ll need a Cast-compatible app. There are many free and subscription options including Tidal, Spotify, Deezer, Rdio, TuneIn Radio, NPR and Google Play Music. As for Apple Music, we’d eat our hefty Awards magazine if it ever cooperates. Apps aside, you can play or ‘mirror’ directly from any computer running a Chrome browser. There is also a multi-room mode, for those with several Chromecast Audio devices dotted around the house. Assuming you already have compatible speakers in different rooms, attaching this little £30/$30 dongle would be a cheap way to get them online and take the fight to the likes of Sonos. The Chromecast Audio’s wi-fi (802.11ac, 2.4 GHz/5 GHz) has a good range, thanks apparently to multiple internal antennae, but don’t expect it to work where you don’t normally get a signal. No wine cellars, then, but your garden or garage may be all right. Google has been tight-lipped about the technical specifics, but we do know the bitrates are dictated by what individual apps can do. That means Spotify, for example, has a maximum quality of 320kbps. We are big fans of the original Google Chromecast, and we're hugely excited to see that bag of streaming tricks being used for music.